I come back to forms of emotional abuse again and again as I believe it is the least understood and acknowledged form of abuse. Emotional abuse exists in all other forms of abuse, sexual, physical and neglect but it also occurs without these other signs and that is why it is so hard to recognise from the outside. Even the victims may not realise what has happened to them, especially when it occurred in childhood. It can take years to come to terms with and recognise the relationship between the emotional abuse and low self-esteem, depression and anxiety that the adult who was emotionally abused in childhood may experience. Low self-esteem involve being made to feel that the victim isn’t as important as everyone else, that their needs don’t count. 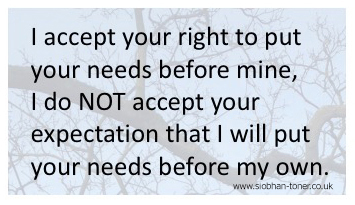 Their abuser’s needs are put before their own and it may be done so subtly they don’t even know it has happened. It’s hard enough to realise it is happening as an adult, much more in a child. The child victim may be very helpful and easy to deal with, after all they have already been taught their needs are less important than others. This is why they so often get missed. As they grow up, they may be sensitive to what they see as selfish behaviour in others. After all, they never put themselves first, how selfish that other people do so. This view can be a symptom of the abuse they don’t even realise they have suffered and they can be very judgemental of other people because of it. They have been conditioned to the fact that they shouldn’t put themselves and their needs first. But really, we all have to do that. Even parents who are doing all they can for their children can’t be totally selfless all the time. After all, if they don’t look after themselves then what impact can that have? Emotional abusers expect others to put them first and they have an array of tools to manipulate, shame and bully their victims into making this happen. It is not a personality flaw to put yourself first, it doesn’t make you bad or selfish. It is part of self-care. What is damaging and abusive is to expect others to put you first as well and to be resentful and coercive when it doesn’t happen.